"I absolutely loved my arrangements. Alondria was great to work with and very helpful. When I first met her I told her I was not into flowers like that so I was not sure what I wanted. She worked with me and provided me with all the details I needed to make my day beautiful. Although I didn't know what I wanted she knew exactly what I wanted. She is very knowledgeable and creative. I really enjoyed working with her and would highly recommend her"
"Thank you for the outstanding job you did for our wedding! The flowers were spectacular! 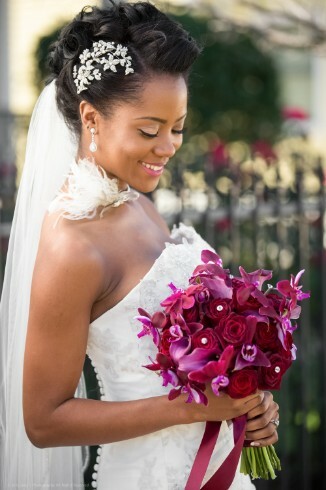 Grace Chiu, July Wedding"
"I was absolutely please with all of my floral arrangements and bouquets! I thought they were incredibly lovely and would recommend Alondria to anyone. She was able to take what I told her and turn it into something remarkable! Thank you very much! Tiffany Geach, April Wedding"